Now I'm trying to make him a walk cycle animation. I selected "tile 0", and clicked on the first tile. Then I made new layers, and named them how I did in drawing01. Then I tried to copy the stuff from each layer from drawing01 to drawing02's layers. But after I finished copying them over, they didn't work like separate layers. Maybe it copied everything into every layer, or something. I tried it many times, but if I managed to put them into separate layers, then tile 0 had a problem, only the stuff from one of the layers was on it. 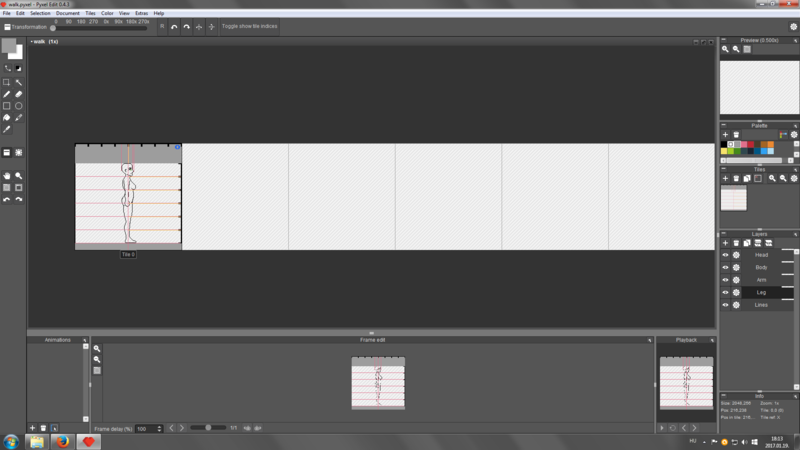 So basically I want all my layers copied to all 8 tiles (with all the drawings in them). And I want the layers to be separate, so I can transform each limb without messing up an other one. I have no idea what to do, I wasted five hours trying to do this, but I just couldn't. Please someone help ! ... I'm desperate. I'm not sure how to help you or whether I understand your question correctly, is it possible for you to upload the pyxel file or show the problem in some other way? The layers are not tile dependant, so if your sprite is split into limbs and you want them on each tile, then you have to place all the parts individually, also taking the layer order into consideration. If you've given the tile an index number and don't want the change to happen on your copies, you can use CMD + right-click (mac) or Shift + right-click to unmap it. Sorry if my question was confusing, I'm not a native english speaker, so my sentences can be a bit weird. Here's a picture of a female character template I made, it's probably easier to show my problem here. I want to make an 8 frame long walking animation for her too. So I made the document 8 tile wide. Now I want every part of her to be on Tile 0, then Tile 1, all the way to Tile 7, and then modify all of them separately. How can I put more than one layer on a tile, without merging them together ? Ahh right, well there are two ways of doing it, none of them are straight forward though. The first is where you click on a layer, then right-click on the canvas tile with that layer, then insert it into the next canvas tile and keep doing that until you've copied everything. It's a tedious task but it should do what you want (although it's not actually one layer, it's several). Thank you very much for the help, and the quick answer ! And not just with a simple answer, but a gif to show me exactly what you are talking about.